Meet Dan McVeigh, Country Music singer/songwriter/Producer/Publisher from Brampton, Ontario. 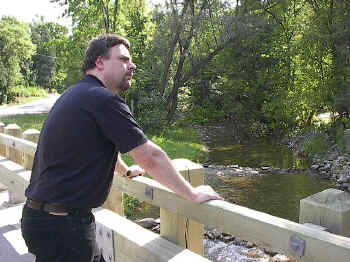 Dan grew up in Sudbury and Renfrew, Ontario and has been involved in the music industry for 25 years. He began playing the piano when he was 7 years old and learned to play the guitar as a teenager. He began writing songs when he was 18 years old, and since has 5 Billboard songwriting awards to his credit as well as finishing 4th in the Canadian Country Music Hall of Fame Songwriting Competition. Dan performed as a keyboard player/lead vocalist in a number of Top 40 music groups before working on his career as a solo artist. Since 1994, Dan has been involved with the Nashville Songwriters Association International (NSAI) which is one of the world’s largest songwriter organizations. He runs the Toronto NSAI Workshop as a NSAI coordinator along with Bruce Madole. He was recently recognized for his work in the community from the City of Brampton with a 2001 Arts Acclaim Award. He own and operates a digital recording studio and music publishing company called “Play It Again Dan Music”. Dan’s studio produces songwriter demos and CD’s for both himself and other songwriter/artists. He also produces music for Film/Television and also video productions. Recently, Dan fulfilled his lifelong dream by recording his debut CD entitled, “Love and Bridges”. The album is a collection of 15 songs all written or co-written by Dan, and includes beautiful songs about love to songs that will make you smile to songs with social commentary. Dan has something for everyone in this album to enjoy and listen to. Dan’s songs have been recorded by a number of Canadian artists, including Debbie Nelson who released one of his co-written songs with Bruce Madole on Royalty Records, entitled “Doesn’t Really Matter”. Dan performs in the Toronto area quit often and performs in Nashville, Tennessee from time to time. More information about Dan, his songs, his music and his studio can be found on his website posted above.